This high temperature stove paint for high temperature stoves is easy to apply and helps prevent rust and aging to your stove. 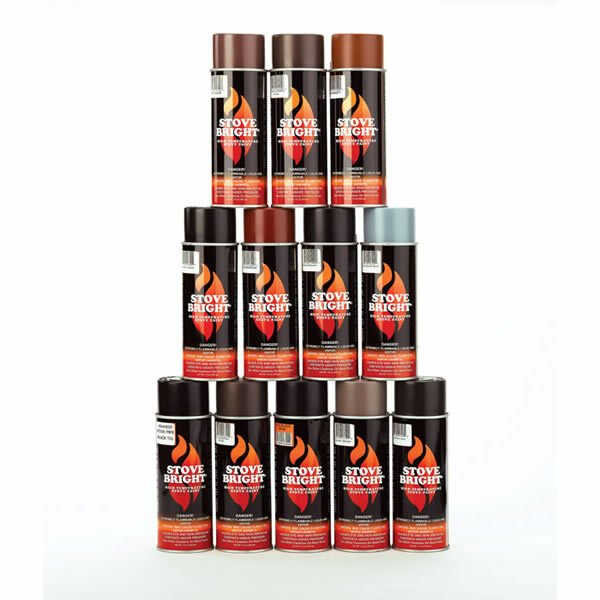 This Stove Bright paint will keep your stove looking its best for many years because it touches up worn spots, chipped spots, scratches, and heat bleached areas, as well as promotes the longest life possible for your charcoal stove. 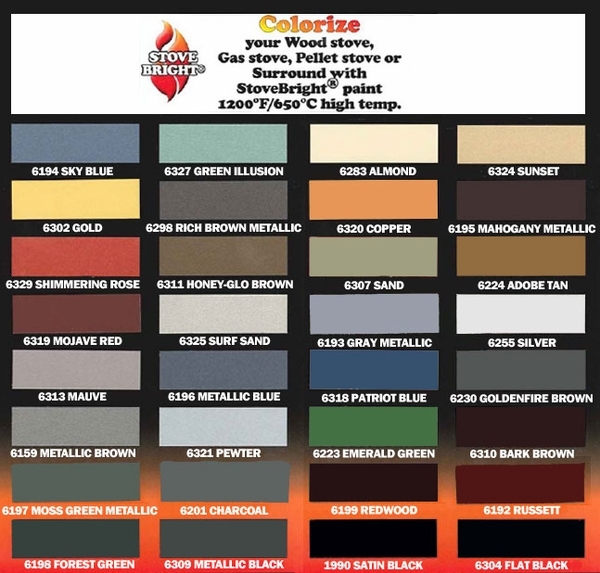 The Stove Bright company makes these paints in in a variety of colors to match almost any stove color, and holds its color up to 1200 degrees. What is the coverage area of one can of paint? Average coverage for tone can of paint is plus or minus 6 square feet. Can this paint be used on Hydronic baseboard heaters? Because of the relatively low external temperatures maintained on the outer chassis of this type of heater, you can indeed utilize this paint, as it will be well within the temperature specifications. Can this paint be used on the inside of a masonry fireplace? This is only recommended if the masonry fireplace is no longer being used for wood burning. Burning wood will cause the paint to discolor and flake, however it will work well with a gas burning appliance. Can this paint be us to finish the outside of a wood/coal burning pot belly stove? How dark using the charcoal color paint? This product can indeed be used for that purpose. The charcoal paint color will appear black in most lighting. In direct sunlight, it will have a very dark gray appearance, similar to graphite. Will this paint hold up on the outside of a small BBQ grill? This paint would indeed suit your needs. It will be necessary to clean and/or sand the surface of the grill to remove any corrosion. The paint can then be applied in multiple light coats, until good coverage has been achieved. What is the sheen of this product...flat, satin or gloss? This particular paint will dry to a satin finish. I have used this paint for many years and find the quality superior to any other brand I have tried. Shipment was unbelievably fast as well... will purchase again from this company!